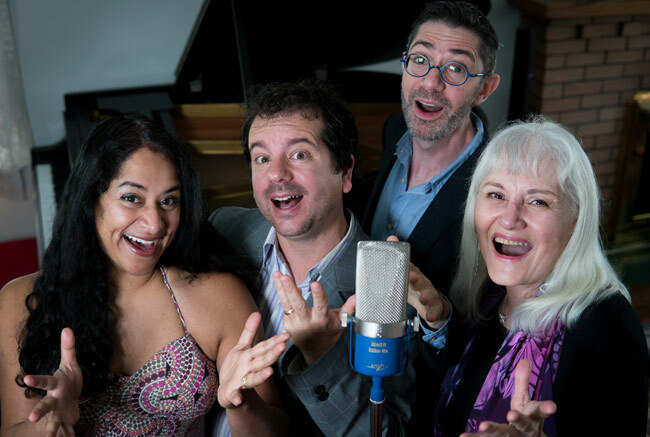 Hampton Avenue, Jazz Acappella Vocal Ensemble, was established in 1995 under the leadership of Debbie Fleming. They began as a 9 voice group of professional singers who loved singing arrangements of songs by The Hi Los, Singers Unlimited, Manhattan Transfer and Take 6.
arranged with tight jazzy harmonies, and upbeat rhythms. Over the next 7 years, they continued performing, and recorded another CD, entitled “Everybody Sing” – this time with 8 voices. In 1999, they received a Jazz Report Award for “Vocal Group of the Year” based on their success with these two amazing albums, which may be purchased by visiting our Market page. Debbie Fleming, Suba Sankaran, Dylan Bell and Tom Lillington.